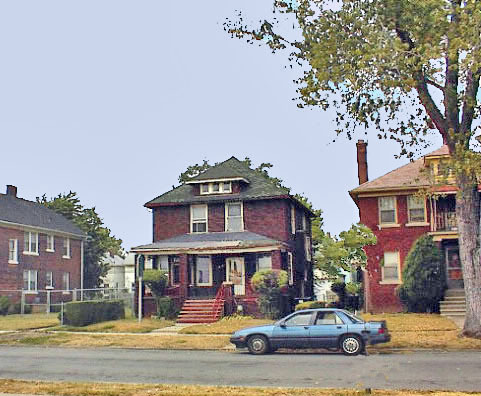 Detroit's prosperity in the 1920s and the willingness of manufacturing firms to hire many African Americans led to a substantial increase in the black population able to afford attractive homes. Jim Crow practices and violence, such as that directed at Dr. Ossian Sweet, restricted African Americans to the "Black Bottom" neighborhoods. Some middle-class blacks were able, in the late 1920s, to move to neighborhoods near Grand Boulevard and Tireman, but on the southeast side of Tiremen. Tireman served an unofficial but very clear and well understood marker of the Jim Crow line separating black neighborhoods from white neighborhoods. One peaceful way of maintaining racial and religious segregation was for a developer to write a restrictive covenant into a deed saying that the property could only be occupied by Caucasians, or that Negroes, Asians or Jews could never occupy the property. Some state courts upheld restrictive covenants as Michigan courts did, while in other states, they were overturned. In 1922, the Federal Supreme Court strongly upheld the use of restrictive covenants in their Corrigan v. Buckley decision. Jewish civil rights organizations strongly cooperated with African American organizations in fighting against covenants since both groups were often targeted for exclusion. During the Depression decade, the demand for housing in Detroit plummeted. Owners were looking for renters so they paid less attention to the color or religion of the applicant. As I understand it, the owner of the property at 4626 Seebaldt knew that it had a restrictive covenant limitting occupancy to Caucasians, but they were so in need of cash that they rented it during the Depression to African Americans: Orsel McGhee who was a supervisor of maintenance at the Detroit Free Press and his wife, Minnie, sorted mail for the post office. They lived on Seebaldt for about a decade and sought to purchase the home. During the World War II years, whites in many Detroit neighborhoods knew that the high wages of that era were creating a large black middle class who could afford to live outside of the neighborhoods where Jim Crow had confined them. Whites in the Seebaldt street neighborhood organized a neighborhood club in 1944 and emphasized enforcing the restrictive covenant that prevented the McGhees from living on Seebaldt. Since the McGhees were, apparently, well-liked by their neighbors, the block group had a hard time finding a litigant who would sue to remove the McGhees. Eventually, the Sipes family agreed to become a plaintiff and a suit to expel the McGhees was filed in Detroit's Recorders Court. 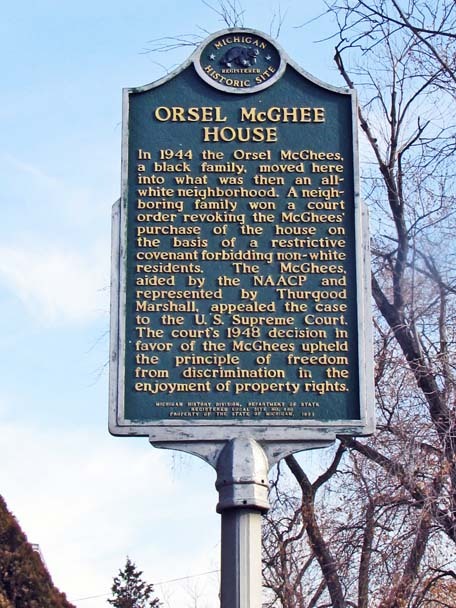 The strong NAACP in Detroit immediately recognized the significance of the litigation and defended the McGhees. The called upon the sociologist, Mel Tumen, from Wayne who argued that racial categories were not scientific and that no one could scientifically define the term Caucasian or certify that the McGhees totally lacked Ca ucasian blood. This was a typical defense used at that time in restrictive covenant cases. Detroit's Recorders Court agreed with the plaintiffs, upheld the restrictive covenant and ordered the McGhees to leave. The NAACP immediately appealed and advanced the case through the Michigan state courts. 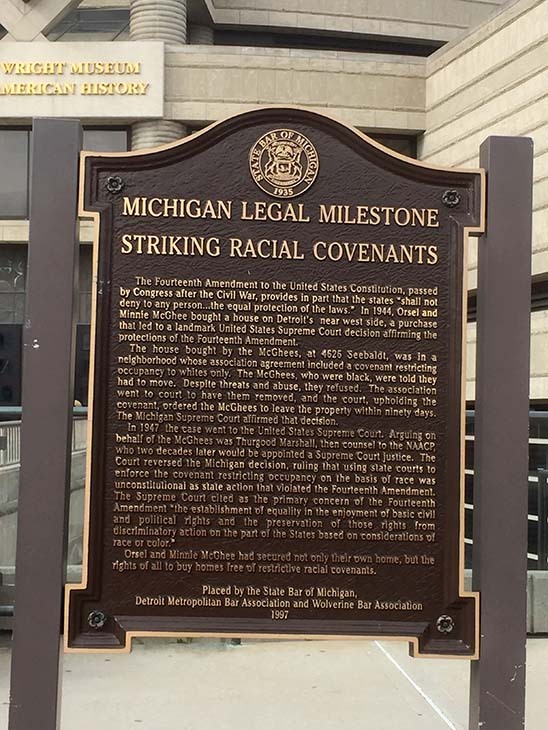 Eventually the Michigan Supreme Court upheld the restrictive covenant, but the NAACP won a stay of their expulsion order and filed suit in federal court. When the McGhee v. Sipes litigation reached the Supreme Court in Washington, the judges had two other restrictive covenant cases to decide. The lead case was Shelley v. Kramer concerning restrictive covenants in St. Louis. The Supreme Court merged the Seebaldt Street litigation with that from St. Louis since the instant matter was the same. The Supreme Court had ruled in 1922 that restrictive covenants were legal but in their 1948 decision in Shelley v. Kramer, the Supreme Court decided that while there was no federal prohibition against including restrictive covenants in property deeds, no state or federal court could enforce them. Civil rights activists viewed this as a great victory since restrictive covenants could not longer be used to keep Jews or blacks out of a neighborhood. However, developers continued to insert them into property deeds until the 1960s. In theory the Shelley v. Kramer decision was a major blow to Jim Crow practices in residential segregation but the actual segregation of blacks from whites in neighborhoods did not start to decline until well after 1970, presumably due in part to the Open Housing Law that Congress passed in 1968. In the early Twentieth Century, this home was falling into disrepair. Indeed, many of the homes in this neighborhood have been abandoned. In 2012, the Detroit Historical Museum began working with the owner of this property with the aim or listing this property on the National Historic Register and then finding funds to preserve the home in light of its importance in this nation's long history of the fight for equal racial opportunity. The Bar Association of the State of Michigan has erected 40 historical markers commemorating Michigan Legal Milestones. One was dedicated to honor the significance of the Sipes v. McGhee litigation and erected, in 2016, in front of the Wright Museam of African-American History along East Warren. Michigan Historical Marker: Erected: June 16, 1983. This marker is clearly visible directly in front of the modest home at 4626 Seebaldt.